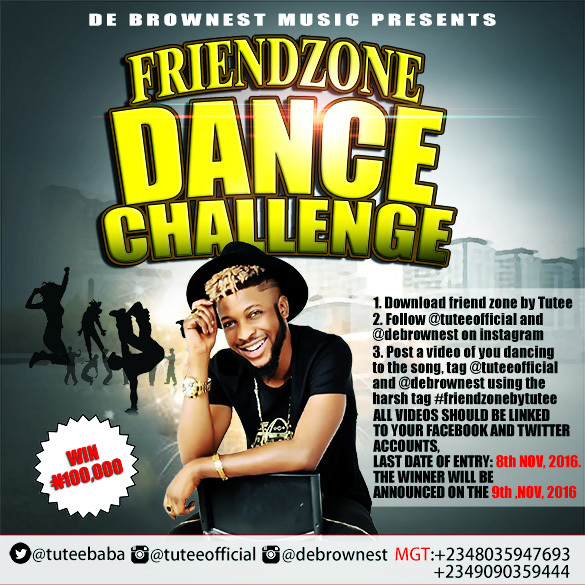 Get Involved in the Friend Zone Dance Challenge & Stand a Chance to Win N100,000! The Friend Zone Dance Challenge is here! Are you cool and energetic? Do you like reggae beats? Then join in the Friend Zone by Tutee dance challenge. 1. Download friend zone by Tutee free online. 2. Follow @tuteeofficial and @debrownest on instagram. The deadline for submission is 8th of November, 2016. You stand a chance to win 100.000 cash! Don’t miss this… start dancing and start tagging now!